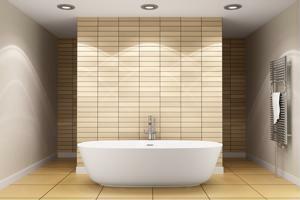 News sources are speculating on what will prove to be the most popular trends in modern bathroom decor in 2013. People who are hoping to keep their powder room up with the times may want to take heed of these taste makers' predictions. Blogging for BoldSky.com, media expert and bathroom accessory enthusiast Tauseef Hussain wrote that sleekness and efficiency will be in this upcoming year when it comes to contemporary bathroom vanities and other washroom decor fare. Right down to soap holders, towel racks and toilet paper holders, hip homeowners will be looking for bathroom accessories that are simple yet elegant and stylish. Other aesthetics that will either come into or continue to be in fashion include natural tones in tiles and wood and more water-saving faucets, shower heads and toilets. That doesn't mean classy bathrooms will start to feel rural or antique - they'll be aiming for the unfussy yet luxurious atmosphere of a home spa. "The ultimate way to tie together the latest bathroom design aspects for 2013 is by following the growing trend of creating your very own spa-like experience within your home," Hussain wrote. Noting that a current and comfortable aura in the bathroom may help the price of a house go up, Lushome published the top 15 styles of bathroom decor it predicts will be all the rage in 2013. While some aesthetics fall in line with the expectations voiced on BoldSky - more environmentally friendly plumbing, for one - other choices would add more camp and individuality to a bathroom. For a few examples, the source says that wall tiles featuring various mosaic designs rooted in exotic, ancient or futuristic fashions may become more prevalent. It also points to colorful Art Deco spins on bathroom vanities, wallpaper and mirrors, which could come into vogue, especially for bathrooms designated for use by younger people. "His and Her's" sink arrangements, as well as splitting the bathroom into a pair of joined but separate rooms for added privacy, is listed as a bathroom style we should expect to see more of.